April 24, 2018 By Alysha Leave a Comment This post may contain affiliate links. Read my disclosure policy here. Aaaaaa, paradise…. white sand beaches, palm trees, fresh tropical fruit, warm breeze… reserved only for the rich and famous, right? WRONG! You can totally go on a beautiful Hawaii Vacation when you are on a budget! It’s 100% doable! Take notes, everyone, because I’m about to show you how anyone (yes, even you!) can enjoy a Hawaii Vacation on a budget! I consider myself quite the budget-savvy traveler. My husband usually would rather spend “fun” money on electronics so I’ve learned to show him that trips can be fun and affordable (and way better than electronics.) 😉 He’s a good sport and always enjoys them. I’ve been to Kauai once, Maui twice, and Oahu twice and have learned some tricks to enjoying these gorgeous destinations without going broke. Though you have 6 major islands to choose from, I’m going to be focusing on Oahu, but just for fun I’ll throw in a bit of the other islands here, too. Now, you are dreaming about that island breeze and warm beaches already, but how do you get started? FLIGHT. This is being covered first because it’s most important (and if you don’t plan smart, you will waste your budget on your flight). 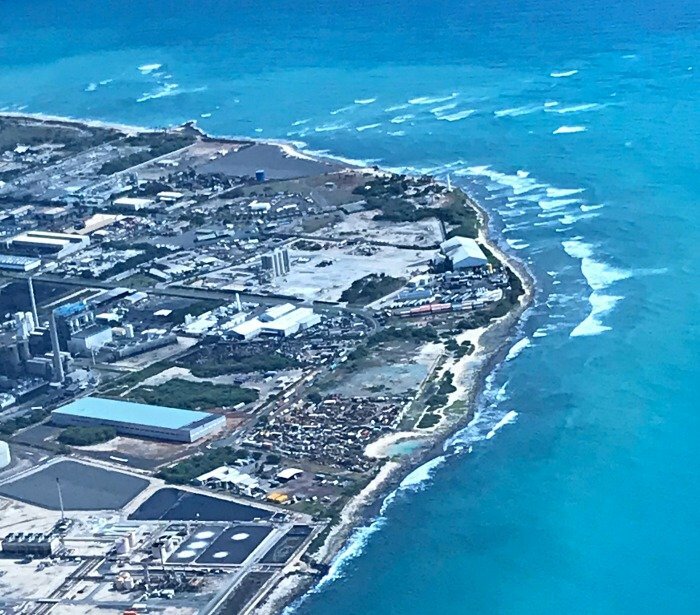 Cheap Flights to Hawaii can be hard to come by if you don’t plan ahead, because Hawaii is always in high demand. My biggest recommendation is to use Cheap Air for searching for flights because they have a flexible dates search option, but mostly because they have Price Drop Payback, which offers you a travel credit if your particular airfare drops in price after booking. I hate it when I wait to book a flight because I think the flight price will drop, and then it only gets more expensive! This takes the worry away. They also have a fare tracker that you can set up. It emails you when there are cheap flights to Hawaii. Remember that flights leaving on Tuesdays are almost always the lowest price. Adjusting the day of the week you are leaving and returning affects ticket prices significantly. They also have a “When to Buy Flights” option that will give you advice for your particular airport and options. You can also search for Hawaii in the “Flights deals” section of the website. If you really want cheap flights to Hawaii, you can plan ahead by signing up for certain credit card bonuses and get a free flight. Alaska Air gives you a companion pass which would allow someone to fly with you, and they also give a 30,000 point bonus for signing up, which makes the first ticket cheaper too. Southwest has announced that they are going to soon offer Southwest flights to Hawaii, so signing up for their card is another great way to score a flight to Hawaii. It is expected that they will start offering these flights end of 2018, or early 2019. See our post How to Get Free Flights for more info on how we score free flights with Southwest. 2. 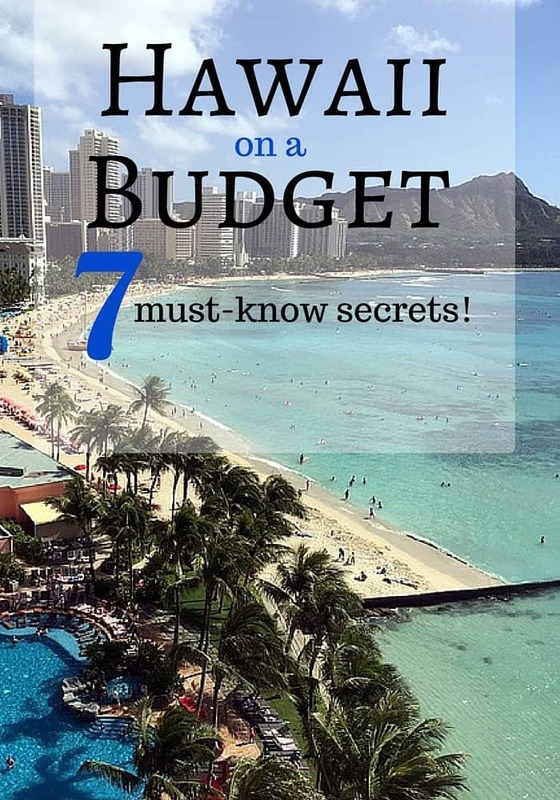 SET A Hawaii Vacation BUDGET and set aside that money. Why? Because if you don’t, you come home and realize that you just spent your mortgage on tropical smoothies and leis. There are so many AMAZING, shall we say, temptations in Hawaii. It is very easy to be swept off your feet and overspend. 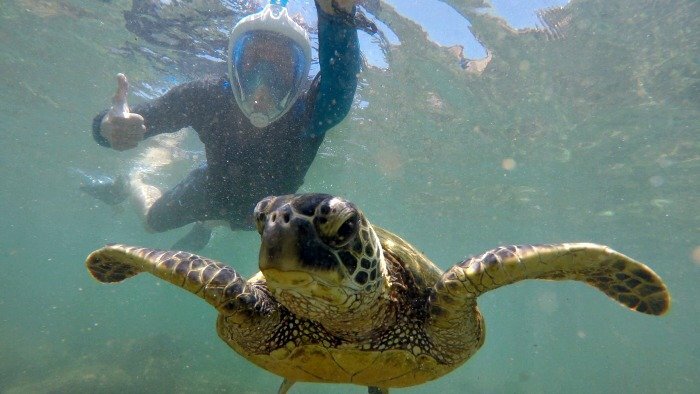 That being said, there are SO MANY free things to do in Hawaii, that you really can do a trip without spending a bunch. 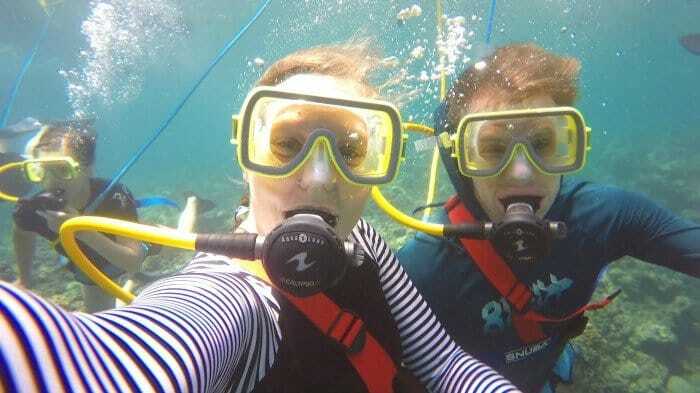 If you are going to Oahu, see our post 103 Free Things to Do in Oahu. Setting a budget beforehand and planning for fun expenses keeps you from overspending. Another reason to set a budget is so that you can do fun things and not stress about the cost! You’ve already set aside the money and you can just enjoy. ONE OF THE BEST ways to do this (if you are visiting Oahu), is to get the Go Oahu Card. That way, you pay for the card upfront, and then all the activities you can imagine are already taken care of for your trip. Off seasons in Hawaii allow you to get flights, hotels and rental cars for cheaper than peak season. Spring and fall are commonly considered off seasons whereas summer and around the holidays are peak. This is a general rule of thumb, but be aware that you may find a great deal on flights in the peak season if you have alerts set up on Cheap Air. 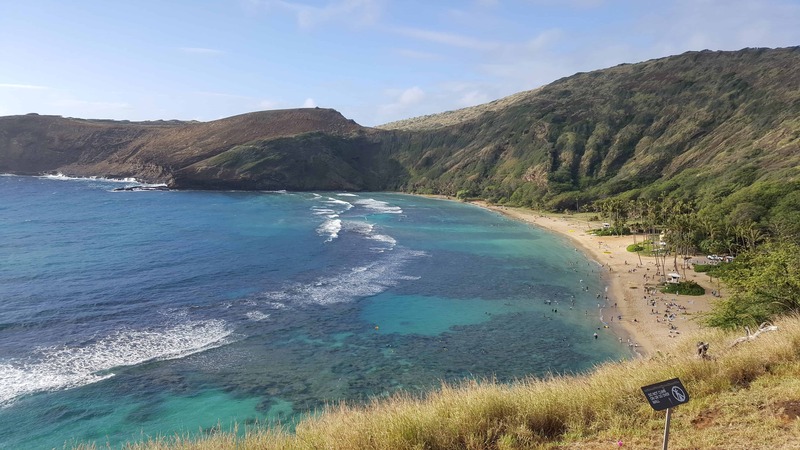 Winter is a great time to go to Hawaii because of whale watching and escaping the cold– just don’t expect to find great deals on rental cars or hotels so you’ll want to factor that into your budget. Do look around though! Deals happen. Living Social is available for Oahu and the Big Island, a site where you can get activity and restaurant discounts. Unfortunately, they haven’t hit the other islands but you’re in luck if you are going to the capital city of Hawaii. Months before your trip, sign up for these daily deals. You can search through them until you find the perfect activity(s) for you and your budget. It’s a great way to eat out and enjoy activities that otherwise would be too pricey. It also allows you to get more bang for your buck and do multiple activities where before you may have only been able to afford one. My husband and I were able to eat at a very fancy restaurant for our anniversary for WAY less than normal and the both of us got to enjoy a Catamaran Cruise for less than half of what it normally costs for one person to go! The Catamaran Cruise ended up being our favorite activity and I don’t think we would have tried it had we not gotten that deal. Planning your trip is incredibly important, even if it’s just knowing which region of the island to be at each day. Planning allows you to maximize your vacation and not miss out on the must-see items on your checklist. You’ll also save on gas by making sure you plan activities that are close to each other each day. Don’t forget to plan time to relax! 7. Eating on Your Hawaii Vacation: Utilize COSTCO for Food!!! Lucky for you — now Costco is on Oahu, Maui, Kauai, and The Big Island! You have to have a membership but this is so worth it! If you have any kind of mini fridge or kitchenette in your hotel, buy groceries at Costco! Restaurants are super pricey and eating out for every meal, every day, adds up big time. Don’t be sucked in to buying groceries from the local ABC Store either– we bought a gallon of milk for almost $10. That combined with the cereal, plastic bowls and plastic spoons ended up costing more than what it would have cost to go to McDonald’s every morning. Lesson learned. Costco is a great way to buy food on a budget– you can pack picnic lunches to eat on the beach and make your own dinners. Thanks to Groupon or Living Social, it will still be possible to enjoy a few restaurants but this way you won’t have to stress when you do! Also, while at Costco– fill up your gas tank! It is usually cheaper than any other station. Let’s face it, hotels are going to be a major part of your budget. You just have to count on that, unless you go with one of the camping options below (Hawaii would be a great place to camp). Trip Advisor is my favorite place to search because it allows you to compare a bunch of different sites and find the best price. If you go to the Hawaii landing page, you can find guides on each of the islands, as well as look up hotels in various categories (for couples, family friendly, best beaches, popularity, etc.). I have also booked a ton of our vacations on Travelocity because they are always competitive, they give you discounts on other parts of your vacation once you have booked with them, and they are really easy to cancel. It also tells you how popular your dates are, and how booked that particular area is (for example: “Maui is 96% booked for your dates.”). This will help you to know how fast you need to reserve your lodging. I really like to read reviews on Trip Advisor before I stay at ANY hotel, but sometimes it takes a lot of time, so what I will often do is book multiple hotels on Travelocity (so they don’t book out or get more expensive), and then once I have read all the reviews and made a decision, I will go into Travelocity and cancel all the ones I don’t want. Most hotels will let you cancel up to the week of your trip, and Travelocity makes it really easy to do that (just click a button). Vacation rentals are an excellent way to save money on your Hawaii vacation! VRBO is our favorite, but airbnb is another great option. We have found many beachfront options in the $100/night range! If you are more picky and have your heart set on a fancy resort, I’ve also found you can book many of the resorts on VRBO for a lot cheaper than you can direct, because vacation owners will rent out their timeshares here. We have booked the Honua Kai twice through VRBO (in Maui) and the Waipouli Beach Resort (in Kauai) through VRBO and got much better rates than anywhere else. Don’t totally close your mind off to the idea of camping in Hawaii. It’s such a beautiful place and we rarely spent time in our room anyway, that I would totally camp in Hawaii! It’s a great way to save money! Here’s a list of the top 10 Hawaii Camping locations, including some cabins and tentalows! There you have it, you can afford to go to Hawaii. 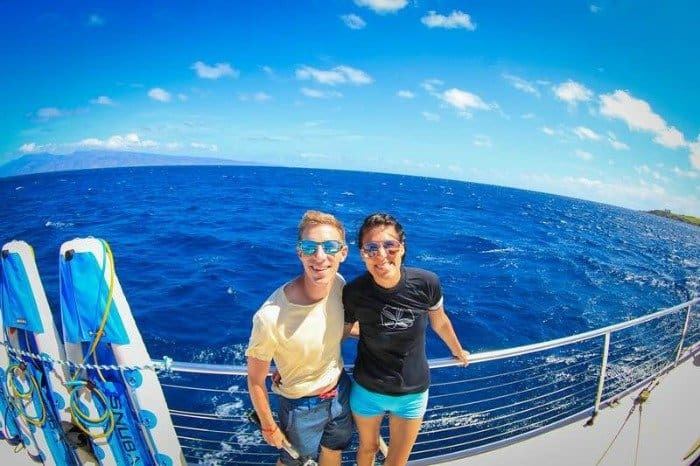 What tips have YOU discovered that allowed you to enjoy Hawaii on a budget?!? I'm a mama of 2 and love traveling, getting the most bang-for-my-buck, and going on adventures! I have a floral business and have a deep love for nature and all things beautiful.